This news is coming after years of anticipation. 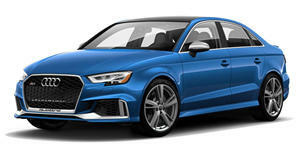 Audi has officially unveiled the RS3 Sportback, and will go on sale early next year with a starting price of €49,900 ($68,522). The best part is that there are details to divulge about this great car. It&apos;s powered by the same turbocharged 2.5-liter five-cylinder engine found in the TT-RS, and it can produce up to 335 horsepower. This power is connected to quattro all-wheel drive and a seven-speed Stronic transmission. The result is a 0 to 60 mph time of 4.6 seconds and a top speed of 155 mph. The exterior has aggressive fascias, an anthracite grille, and carbon fiber reinforced plastic fender flares. Adding to the design are xenon headlights, a reduced ride height, aerodynamic side skirts, matt aluminum accents, a dual exhaust system, and 19-inch alloy wheels. Inside, the cabin is fitted with Fine Nappa leather sport seats, Piano black trim, a new steering wheel, and a revised driver information system with lap timer.